Browser Security is a free browser add-on which is claimed to be capable of protecting your browsers against stealthy computer infections and phishing websites. The program has its official website browsersecurity1.com, which is very similar to the official websites of Win Guard, Web Check, Web Enchance, and some other programs. All these programs are advertising-supported, which means that after installing the program, you are provided with third-party advertisements, none of which is endorsed by Browser Security. Browser Security is regarded as an adware program, and we recommend that you remove this program from the computer as soon as you can. Browser Security is compatible with Internet Explorer, Google Chrome, and Mozilla Firefox, and Browser Security advertisements are displayed 12 after installation. The adware program displays its advertisements mainly on shopping websites, including walmart.com, ebay.com, target.com, etc. There are different types of advertisements, such as web banners, interstitial ads, pop-ups, and pop-unders, and, after installing Browser Security, you are likely to be provided with advertisements of different types, mainly coupons that are not necessary related to the underlying website. Due to the fact that Browser Security does not endorse the websites advertised, we advise you to ignore all those pop-ups because some of them are likely to be related to insecure websites. For instance, you may find pop-ups encouraging you to update your browser or Java player. It is essential to ignore such offers because instead of the update you may be asked to install some questionable programs. By installing Browser Security, you agree to be provided with third-party advertisements and accept responsibility for your interaction with third parties. It is known that Browser Security, as well as the identical programs, are bundled with other free programs, and these program include OffersWizard, DolphinDeals, Remarkit, FlowSurf, and many others. In order to prevent unwanted programs, you should be very attentive every time you launch any setup file, but, if it is too late, take some measures to get rid of the unwanted program. 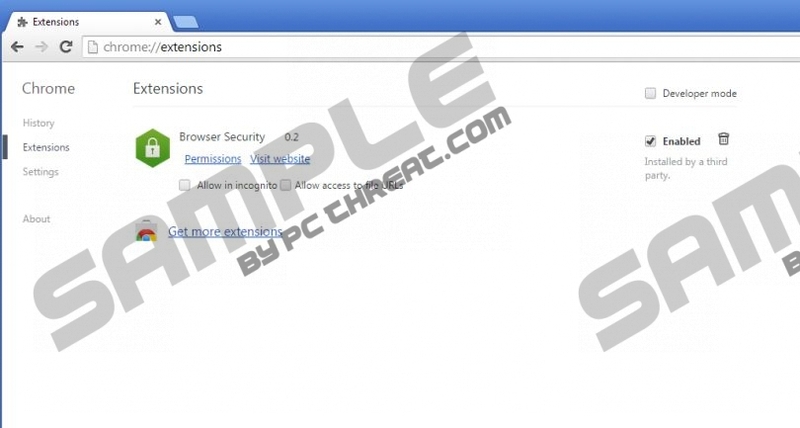 Below you will find our step-by-step instructions on how to uninstall Browser Security. However, if you want to be sure that the computer is malware-free, you have no choice but to install a reputable security program. Do not hesitate to implement a reputable security program because it is by far the safest way to ascertain what the actual security level of your operating system is. In order to have Browser Security removed and the system protected, install our recommend tool SpyHunter. Quick & tested solution for Browser Security removal.